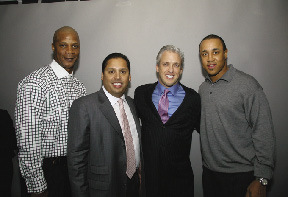 Shown (from left) are: Former New York Met, Darryl Strawberry; Alliance Building Services president, Michael Rodriguez; Gary Green and former New York Knicks, John Starks at the 2008 Alliance holiday party. 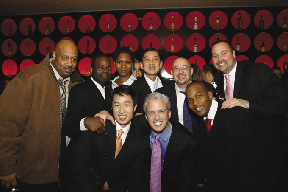 Gary Green with Alliance staff at 2008 holiday party. For Gary Green, the reason to start a building service company at age 26 was self evident - the industry was made up of companies who were providing inadequate service at an exorbitant price. Coming from a real estate family, Green knew how owners thought and what their needs were. "I had first hand experience with janitorial companies that provided very mediocre service and were over charging tenants and landlords for it," Green says. "Anytime you can provide both superior quality and lower pricing, it can be a great business opportunity." So, in 1992, Green started First Quality Maintenance (FQM). More than 15 years later, the company known as Alliance Building Services is one of the most successful building service companies in the tri-state area and employs a staff of over 3,000 people. Alliance not only includes FQM but Classic Security, which focuses on building security officers and access systems, Bright Star Messenger Centers, which provides buildings with messenger centers as well as a layer of added security and Onyx Restoration & Painting, which supplies painting services and specializes in the restoration and maintenance of stone, metal and marble finishes. In May of this year, Alliance acquired a lighting and electrical company as a compliment to the First Quality division. Green is a firm believer that organizations should treat their employees as well as they treat their customers. He feels that in order to establish a positive and successful company culture, an effective and open-minded leader is required. Staff at the executive level should not be oblivious to their employees' wants and needs. In a world where chief CEOs and presidents are commended more for increasing profit margins than for inspiring their workers, Green is a leader who fully understands the impact that he can have on his staff. Furthermore, he is an advocate of setting goals and creating access to development and training courses. "In order to provide an encouraging work environment, business owners and managers should work to establish a company culture in which employees are respected and valued," said Green. Most recently, Alliance underwent an office expansion which entailed increasing office space from 13,000 to over 25,000 s/f. The remodeling included the building of an employee service center, a place where workers can visit and have their questions and concerns addressed in a personalized and time efficient matter. In addition, Green ensures that Alliance employees receive extensive training and are encouraged to strive for awards, such as Cleaner of the Year and Security Guard of the Year. Currently, under Green's leadership, Alliance has risen to be among the largest building service providers in the tri-state area, servicing more than 100 buildings, encompassing more than 60 million s/f. The company continues to gain significant market share throughout New York and is continuing to extend its reach into New Jersey and the greater metropolitan area. Alliance provides services for clients such as Broadway Partners, George Comfort & Sons, Stellar Management, SL Green Realty Corp., L&L Holdings and Murray Hill Properties. Since his first job, running freight elevators for Newmark when he was 16, Green was hooked on real estate. 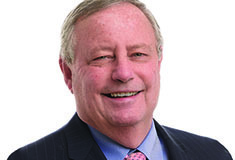 After completing his MBA in finance from New York University, Green worked at Abrams, Benisch, Riker and Riverbank Realty before starting his own company. With his wife, Wende and two children, Green enjoys downtime at home, is a die-hard Mets fan and is in involved in several charitable organizations. 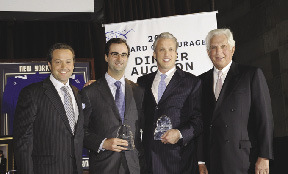 In fact, Green was recently honored by The Award of Courage Corporation at its annual dinner and auction, raising $1.2 million to benefit The Memorial Sloan-Kettering Cancer Center. As for the future, Green plans to continue to improve the Alliance workplace and to actively seek business endeavors to expand both the geographical boundaries and services of the company.